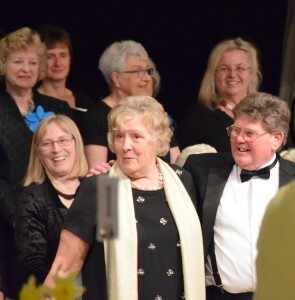 This was an evening that Teignmouth Sings had been looking forward to for a long time…..
A local couple, Anita and Michael Bartlett, contacted us in late 2014 to ask if we would sing for a special event they were organising at the Langstone Cliff Hotel in Dawlish Warren – their Golden Wedding Anniversary! Anita and Michael liaised with Teignmouth Sings as regards choice of music, and wanting their special occasion to be a little different, had hit on the idea of their guests donating to chosen charities rather than presenting them with gifts. At the end of the performance we presented Anita and Michael with a congratulatory bouquet and a card signed by members of the choir. The money raised by the event for Children’s Hospice South West was £405. We were recorded by a member of the audience singing Chattanooga Choo Choo…. 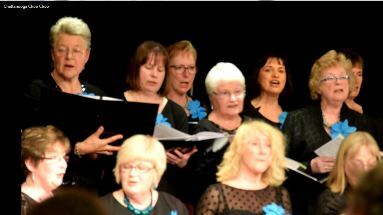 This entry was posted in Events on March 29, 2015 by Teignmouth Sings.